"Cranberry" was originally published in the mid-19th century, and reflects a time when commercial cranberrying was in its infancy. As hinted at in the poem, children were involved in harvesting the berry and some local schools like that at South Middleborough were closed in September in order to free the children to work on the bogs or, as they were known in mid-19th century parlance, "swamps". Poem from untitled newspaper clipping, mid-19th century. 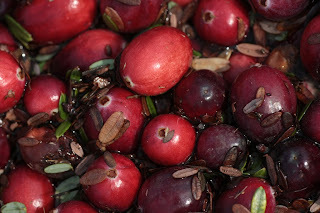 "Cranberry Harvest on Nantucket, MA", Rene S., photographer. October 6, 2007. Republished under a Creative Commons license. Some rights reserved.